The Sharma brothers consist of former boxer, Brijmohan; Jagmohan, an Electrical Engineer; and Manmohan, a Mechanic. The brothers operate a garage under the name of 'Mohan Brothers' in Bombay. Brijmohan hates all women and does not permit even a poster to be hung on the walls of either the garage or their residence as well as instructs his brothers not to get involved with them. While working the late shift, Manmohan assists a customer, Renu, and both rather dramatically fall in love. Subsequently, Jagmohan meets with Renu's friend, Sheila, and both are attracted to each other. Unable to face the wrath of their brother, both conceal this information from him. Then the duo find out that their brother hides a woman's photograph under his pillow, but when confronted, refuses to divulge any information to them. Things will change rapidly when Manmohan finds out Renu's father, Kishinchand, has made arrangements for his daughter's to wed Prakashchand, the son of Raja Hardayal Singh. More details of CHALTI KA NAAM GAADI on wikipedia. Original CHALTI KA NAAM GAADI VCD released by T-SERIES comes in 4 disk VCD pack. While processing the order, we bubble wrap the VCD in its original packing and send it in sealed plastic or carton pack. We don't offer download of the Movie CHALTI KA NAAM GAADI, nor we send free poster of the Movie along with its VCD order. We also don't offer free wallpaper or song download of the Movie. Poster and other accessories of the Movie can be purchased separately. 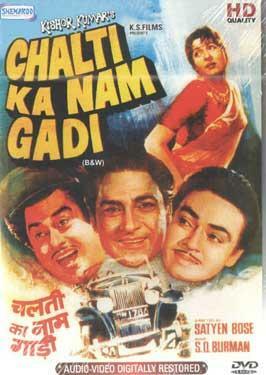 Buy Hindi VCD CHALTI KA NAAM GAADI and watch them at the comfort Of your own home. Online shopping CHALTI KA NAAM GAADI VCD, Buy CHALTI KA NAAM GAADI VCD, purchase original Hindi VCD of CHALTI KA NAAM GAADI. Online store to buy CHALTI KA NAAM GAADI VCD	, online VCD store india, buy Hindi VCD, watch Hindi movie CHALTI KA NAAM GAADI videos online. We don't offer VCD renting for Hindi movies online, Buy Original CHALTI KA NAAM GAADI VCD @ discounted and cheapest price online in India.